Originally I didn’t want to publish this here because it uses larger 18-gallon bins, but under my new definition of bucket it’s allowed in. 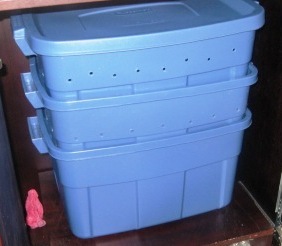 I built my worm farm last winter and stocked it with red worms from our backyard compost bin. It was a successful project, and a great experience, so I’ll probably build another one in my new place soon. Jimmy Carter’s cousin Hugh raised crickets and worms down in Georgia to sell for bait. He died in 1999 but his ad appeared in Organic Gardening for many years. Helpful, thank you. I hadn’t been sure if I wanted to build one or not, and you cleared that up for me. I built one like it too and it worked very well till fresh compost was added which heated up naturally to about 105F. There were other bins to move to which had cooler soil but the worms decided to move out by the thousands (I stocked it with 5,000 red wigglers) up and over the sides between the tubs. How do you prevent your worms from doing that?